You don’t have to travel across the ocean to have a transformative Scouting experience. But if you’re ever lucky enough to visit Kandersteg International Scout Centre in Switzerland, the results will be nothing short of legendary. Over winter break, Dakota Scott spent a week at Kandersteg. 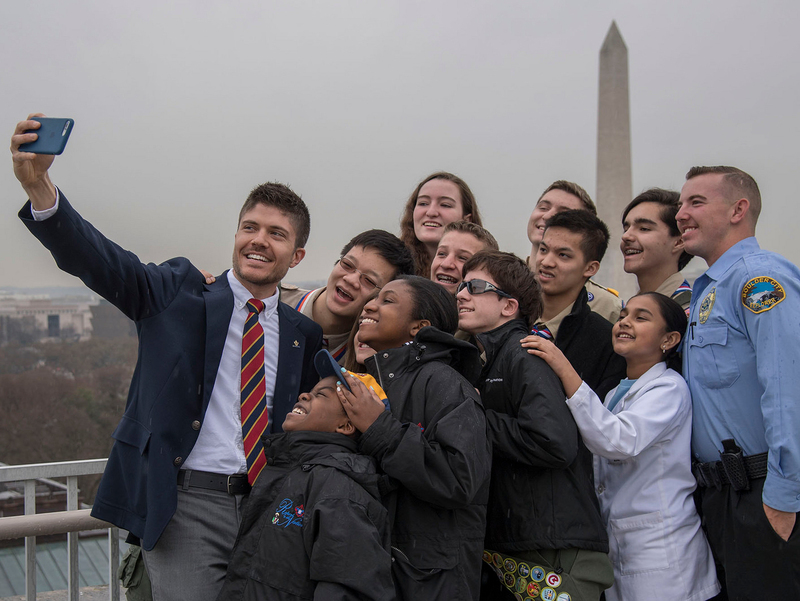 He met 29 other young people from 15 different national Scout organizations. Together, they rang in the new year, completed a service project, explored the Alps and formed lifelong friendships. Dakota left with a newfound appreciation for and interest in world Scouting. Back in Texas, he summarized his emotions for his dad, Gary. After the first World Scout Jamboree in 1920, Scouting founder Robert Baden-Powell dreamed of having one place that would become a permanent mini-World Scout Jamboree. The World Scout Jamboree happens only every four years, B-P reasoned. Why not create a permanent, year-round hub for this spirit of world brotherhood, peace and friendship? His dream came true in 1923 when Kandersteg International Scout Centre was founded. B-P’s theory that Scouts from around the world would flock to the Swiss Alps has been proven correct year after year. In 2018, 14,330 participants from 60 different countries visited. Speaking of the World Scout Jamboree, I should note that, for Americans, this summer’s event at the Summit Bechtel Reserve in West Virginia will be the most accessible in a generation. Go here to learn more about the first World Scout Jamboree on U.S. soil since 1967. What did Dakota do at Kandersteg? Dakota is an 18-year-old Eagle Scout from the BSA’s Dallas-based Circle Ten Council. He’s registered as an adult in the BSA, but Kandersteg considered Dakota a Rover. Rovering is a co-ed Scouting program offered by many national Scout organizations. It serves young people ages 18 to 26 and gives these men and women a chance to serve their local Scout units while camping, hiking and having fun with others their age. Dakota visited Kandersteg during International Rover Week. He was one of 30 participants from 15 countries. Only two of the participants were American: Dakota and a young woman named Ella Hirsch, also from Texas. That’s actually by design. Kandersteg limits the number of participants from any given country to ensure cultural diversity. For example, Dakota plans to serve on staff at the 2019 World Scout Jamboree, where he’ll reunite with some of his friends from International Rover Week. What did Dakota learn at Kandersteg? International friendship through Scouting knows no boundaries. International Scouting starts at the unit level. No matter where you’re Scouting, you’re a part of an international family of Scouts. We as Scouts can change the world through simple actions like doing a good turn daily and living by the Scout Oath and Law. The Sustainable Development Goals are a great way to get involved in a cause that interests you and your Scout unit. We as the BSA need to work on having younger leaders in our packs, troops and crews. Keeping older youth involved through programs like Venturing is essential to growth and retention in our program. Anyone can be a Scout. This is something I already felt strongly about, but seeing people from all over the world, of all ages, gender and ability all doing their best to help others really hit home for me. Anyone who wants to create a better world and is willing to put forth the effort to do so while following the Scout Oath and Law can be a Scout. Baden-Powell had a bigger dream for Scouting than I ever realized. He helped with many of the programs we have today and was the visionary behind the permanent mini-Jamboree that is Kandersteg. From Cubs through Rovers and even adult Scouters, international Scouting offers programs for everyone. A necker with a friendship knot is, at times, more valuable than patches — or even cash. Even a Texan with no real winter experience can survive the Swiss Alps! Have you visited Kandersteg? Attended a World Scout Jamboree? Interacted with a Scout from another country?